A good group of geologists standing in front of a classic unconformity in South Africa: the Mogalakwena Formation (horizontal beds) is overlying the Blouberg Formation (steeply dipping black and white rocks). I am a structural geologist interested in understanding the evolution of the continents and quantifying continental deformation. I address these issues through the use of traditional field-based structural geology methods—such as geologic mapping, balanced cross section construction, seismic data analysis, and petrology—as well as modern analytical techniques, including geochronology, thermochronology, thermobarometry, analogue modeling, and analysis of satellite images and geodesy data. Currently, my research group is working on several intriguing continental dynamics is​sues, including orogenic plateau evolution during plate convergence, the thermal structure of the crust in modern and ancient settings and how this affects deformation rates and styles, and regional reconstructions of western North America and central Asia. Related to these problems, I have also been investigating the mechanics of strike-slip faulting on Earth and icy satellites through analogue and numerical modeling. Please see details of my ongoing projects below. Eastern Nevada experienced a coupled history of Mesozoic contraction followed by Cenozoic extension. We have been conducting detailed mapping in the Pequop Mountains to understand this evolution in the broader Ruby Mountains-East Humboldt-Wood Hills-Pequop extensional system. In particular, we have been documenting an underappreciated phase of Jurassic thrusting and folding, with minimal Cretaceous deformation, followed by Cenozoic extension. The intertwined deformation and magmatism relates to valuable gold mineralization. In extensional settings, magmatism may help thermally weaken the crust to drive rapid extension. Footwall advection via rotation during fast extension can quickly cool the crust and alter its integrated strength. We are investigating this coupling between deformation and magmatism in the Colorado River Extensional Corridor in southern Nevada. Specifically, the Searchlight pluton, south of Las Vegas, tilted 90 degrees on its side during regional rotation, and we are examining structural fabrics (magmatic and sub-solidus) and conducting thermochronology to document the effects of rapid cooling on deformation. Parallel and evenly-spaced strike-slip fault systems occur widely in nature, including in the the San Andreas and Walker Lane fault systems, numerous systems in Asia, and even the Tiger Stripe Fractures on Enceladus. The characteristic spacing of strike-slip faults inevitably reflects how the faults interact with one another and with the fault-bounded crust. Thus, this readily observed geometric parameter may be used to estimate the fault strength and stress state across diverse settings. I am currently investigating the formation of these faults systems through mechanical analysis and analogue modeling, and have developed novel method of estimating the absolute strength of active strike-slip faults based on their fault spacing. This research is revealing that the Asian strike-slip faults are extremely weak, which explains the non-rigid behavior of the Asian continent. It also can predict where unrecognized, or recently inactive, faults exist. Parallel evenly-spaced strike-slip faults in (a) California, (b) Asia, and (c) on Enceladus. Model for the development of the northern Tibetan Plateau, showing how the convergence between Qaidam Basin and North China is accommodated by southward underthrusting and distributed vertically-uniform shortening in the crust. The Cenozoic development of northern Tibet involves the interaction between thrust and strike-slip faulting. Through detailed geologic mapping, cross section restoration, stratigraphic analysis, thermochronology, and seismic reflection interpretation, I have been trying to quantifythe magnitude, style, and timing of Cenozoic deformation in the central Qilian Shan-Nan Shan thrust belt of northern Tibet. The observed strain distribution can be used to test various models for the development of the northern margin of the Tibetan Plateau. Thrust belts in northern Tibet link with >1000-km-long left-slip faults, including the Hiayuan, Kunlun, and Qinling faults. An important unresolved question is how the thrust and strike-slip faults interact with one another. 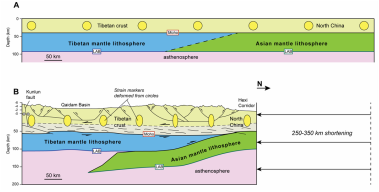 Wu, C. et al., 2019, Mesozoic-Cenozoic evolution of the Eastern Kunlun Range, central Tibet, and implications for basin evolution within the Indo-Asian collision: Lithosphere. Zuza et al., 2019, Underthrusting and duplexing beneath the northern Tibetan Plateau and the evolution of the Himalayan-Tibetan orogen: Lithosphere. Li et al., 2019, Cenozoic cooling history of the North Qilian Shan, northern Tibetan Plateau, and the initiation of the Haiyuan fault: Constraints from apatite- and zircon-fission track thermochronology: Tectonophysics. Zuza et al., 2018, Tectonic evolution of the Qilian Shan: A Paleozoic orogen reactivated in the Cenozoic: Geological Society of America Bulletin. Cenozoic thrusts place Triassic strata over Jurassic rocks. Gabbro outcrop from the Qilian suture. This gabbro, currently at an elevation of 4,600 m, was once part of the oceanic crust beneath the Qilian Ocean. Exposed throughout the Qilian Shan are the dissected remains of the Qilian suture, which recorded the closure of Qaidam against North China ~450 million years ago. Our detailed mapping of Cenozoic structures helps in the restoration of the early Paleozoic configuration of the Qilian orogen. For instance, the numerous outcrops of ophiolitic-melange do not constitute separate sutures, as some believe, but rather mostly represent duplicated features. Much of this research involves coupling geologic mapping and the structural framework with various analytical tools (i.e., metamorphic petrology, whole-rock geochemistry, and U-Th-Pb geochronology). North China and Tarim may have been linked in the Neoproterozoic, and their rifting from another continent led to the genetically-linked birth of both the Paleo-Asian and Pacific Oceans. Wu et al., 2019, Tectonics of the Eastern Kunlun Range: Cenozoic reactivation of a Paleozoic-early Mesozoic orogen: Tectonics. Wu et al., 2018, A 1.9 Ga mélange along the northern margin of the North China craton: Implications for the assembly of Columbia supercontinent: Tectonics. See my profiles on Google Scholar or ResearchGate. Cao, W., Lee, C-T. A., Yang, J., and Zuza, A. V., 2019, Hydrothermal circulation cools continental crust under exhumation: EPSL, v. 515, p. 248-259. Wu, C., Zuza, A. V., Zhou, Z., Yin, A., McRivette, M., Chen, X., Ding, L., and Geng, J., 2019, Mesozoic-Cenozoic evolution of the Eastern Kunlun Range, central Tibet, and implications for basin evolution within the Indo-Asian collision: Lithosphere, accepted. Wu, C., Zuza, A. V., Chen, X., Ding, L., Levy, D. A., Liu, C., Liu, W., Jiang, T., and Stockli, D. F., 2019, Tectonics of the Eastern Kunlun Range: Cenozoic reactivation of a Paleozoic-early Mesozoic orogen: Tectonics. Haproff, P. J., Zuza, A. V., Yin, A., Harrison, T. M., Manning, C. E., Dubey, C., S., Ding, L., Wu, C., and Chen, J., accepted, Geologic framework of the northern Indo-Burma Ranges and lateral correlation of Himalayan-Tibet lithologic units across the eastern Himalayan syntaxis: Geosphere. Li, B., Chen, X., Zuza, A. V., Hu, D., Ding, W., Huang, P., and Xu, S., in press, Cenozoic cooling history of the North Qilian Shan, northern Tibetan Plateau, and the initiation of the Haiyuan fault: Constraints from apatite- and zircon-fission track thermochronology: Tectonophysics, v. 751, p. 109-124 (pdf). Zuza, A. V., Wu, C., Wang, Z., Levy, D. A., Li, B., Xiong, X., and Chen, X., 2019, Underthrusting and duplexing beneath the northern Tibetan Plateau and the evolution of the Himalayan-Tibetan orogen: Lithosphere, v. 11, no. 2, p. 209-231 (pdf). ​Wu, C., Zhou, Z., Zuza, A. V., Wang, G., Liu, C., and Jiang, T, 2018, A 1.9 Ga mélange along the northern margin of the North China craton: Implications for the assembly of Columbia supercontinent: Tectonics, v. 37, no. 10, p. 3610-3646. Haproff, P. J., Zuza, A. V., and Yin, A., 2018, West-directed thrusting south of the eastern Himalayan syntaxis indicates clockwise crustal flow at the indenter corner during the India-Asia collision: Tectonophysics, v. 722, p. 277-285 (pdf). Zuza, A. V., and Carlson, C., 2018, What can strike-slip fault spacing tell us about the plate boundary of western North America? : Terra Nova, v. 30, p. 105-113. Tian, X., Luo, K., and Zuza, A. V., 2017, The Trace Element Distribution Patterns of Ediacaran-Early Cambrian Black Shales and the Origin of Selenium in the Guangning Area, Western Guangdong Province, South China: Acta Geologica Sinica (English Edition), v. 91, no. 6, p. 1978-1991. Zuza, A. V., Wu, C., Reith, R.C., Yin, A., Zhang, Y., Zhang, J., Li, J., Wu, L., and Liu, W., 2018, Tectonic evolution of the Qilian Shan: A Paleozoic orogen reactivated in the Cenozoic: Geological Society of America Bulletin, v. 130, no. 5/6, p. 881–925. Zuza, A. V., and Yin, A., 2017, Balkatach hypothesis: A new model for the evolution of the Pacific, Tethyan, and Paleo-Asian oceanic domains: Geosphere, v. 13, no. 4, p. 1664-1712 (﻿pdf﻿). Wu, C., Zuza, A. V., Yin, A., Liu, C., Reith, R. C., Zhang, J., Liu, W., and Zhou, Z., 2017, Geochronology and geochemistry of Neoproterozoic granitoids in the central Qilian Shan of northern Tibet: Reconstructing the amalgamation processes and tectonic history of Asia: Lithosphere, v. 9, no. 4. Wu, C., Wang, B., Zhou, Z., Wang, G., Zuza, A. V., Liu, C., Jiang, T., Liu, W., and Ma, S., 2017, The relationship between magma and mineralization in Chaobuleng iron polymetallic deposit, Inner Mongolia: Gondwana Research, v. 45, p. 228-253 (pdf). Zuza, A. V., and Yin, A., 2016, Continental deformation accommodated by non-rigid passive bookshelf faulting: An example from the Cenozoic tectonic development of northern Tibet: Tectonophysics, v. 677-678, p. 227-240 (pdf). Zuza, A. V., Cheng, X., and Yin, A., 2016, Testing models of Tibetan Plateau formation with Cenozoic shortening estimates across the Qilian Shan-Nan Shan thrust belt: Geosphere, v. 12, no. 2, p. 501-532 (pdf). Wu, C., Yin, A., Zuza, A. V., Zhang, J., Liu, W., and Ding, L., 2016 , Pre-Cenozoic Geologic History of the Central and Northern Tibetan Plateau and the Role of Wilson Cycles in Constructing the Tethyan Orogenic System: Lithosphere, v. 8, no. 3, p. 254-292 (pdf). Yin, A., Zuza, A. V., and Pappalardo, R. T., 2016, Mechanics of evenly spaced strike-slip faults and its implications for the formation of tiger-stripe fractures on Saturn's moon Enceladus: Icarus, v. 266, p. 204-216 (pdf). Gao, R., Wang, H., Yin, A., Kang, Z., Zuza, A. V., Li, W., Xiong, X., 2013, Tectonic Development of the northeastern Tibetan Plateau as constrained by high-resolution deep seismic-reflection data: Lithosphere, v. 5, no. 6, p. 555-574 (pdf). dePolo, C. M., Henry, C. D., Zuza, A. V., Micander, R., and Faulds, J. E., 2018, Sparkling or still? A tour of geology from Soda Lakes to Stillwater Marsh, Nevada (Guide for the Earth Science Week Field Trip, October 13, 2018): Nevada Bureau of Mines and Geology Educational Series 63, 25 p.
Zuza, A. V., Henry, C. D., Ressel, M. W., Thorman, C. H., Dee, S., and Blackmon, J. E., 2018, Preliminary geologic map of the Independence Valley NE quadrangle, Elko County, Nevada: Nevada Bureau of Mines and Geology Open File Report 18-4, scale 1:24,000, 12 p.
Spycher, N., McKoy, M. L., Ayling, B., Bill, M., Bosshardt, K., Cameron, E., Creason, C. G., DiGiulio, J., Dobson, P., Justman, D., Hammack, R., McKoy, M., Miller, R., Mark-Moser, M., Rackley, I., Rose, K., Siler, D., Supp, J., Veloski, G., Zehner, R., and Zuza, A. (Alphabetical listing), 2018, Small Business Vouchers Pilot: Technical Assistance from Lawrence Berkeley National Laboratory and National Energy Technology Laboratory to Elko Heat Company and the City of Wells, Nevada; NETL-TRS-7-2018; NETL Technical Report Series; U.S. Department of Energy, National Energy Technology Laboratory: Morgantown, WV, 196 p (pdf). Spycher, N., Zehner, R. E., Zuza, A. V., Bill, M., Ayling, B., Hammack, R., Veloski, G., McKoy, M., Cameron, E., Creason, C. G., DiGiulio, J., Dobson, P., Justman, D., Miller, R., Mark-Moser, M., Rose, K., Siler, D., Rackley, I., Supp, J., and Bosshardt, K., 2018, Geothermal Exploration in the Vicinity of Wells, Nevada: Proceedings of the 43rd Workshop on Geothermal Reservoir Engineering (pdf). Dee, S., Henry, C.D., Ressel, M.W., and Zuza, A. V., 2017, Preliminary geologic map of the north half of the Independence Valley NW quadrangle and the adjacent part of the Independence Valley NE quadrangle, Elko County, Nevada: Nevada Bureau of Mines and Geology Open-File Report 17-6, scale 1:24,000, 4 p. (map page). Koehler, R. D., Zuza, A. V., and Faulds, J. E., 2016, A River Runs Through It—Geology along the Truckee River Valley from Reno to Pyramid Lake: Nevada Bureau of Mines and Geology Education Series Fieldtrip Guide, E-59, 19 p.
Zuza, A. V., 2016, Tectonic Evolution of the Northeastern Tibetan Plateau: Ph.D. Dissertation, UCLA, 521 p.
Zuza, A. V., 2011, Late Cenozoic Volcanism in the Hövsgöl Rift Basin: Source, Genesis, and Evolution of Intraplate Volcanism in Mongolia: B.S. Honor Thesis, Cornell University, 31 p.
Zuza, A., Bat-Erdence, A., 2011, Late Cenozoic Volcanism in the Hövsgöl Rift Basin: Source, Genesis, and Evolution of Intraplate Volcanism in Mongolia, in Keck Geology Consortium Proceedings of the Twenty-Fourth Annual Keck Research Symposium in Geology, edited by Varga, R. J., p. 272-280.